Along McGill College Avenue in Montreal City in Quebec, Canada, the Illuminated Crowd sculpture stands at the base of the BNP Tower-Laurentian Bank Tower. This unique piece of art was created by Raymond Mason and has stood at the entrance to these glass skyscrapers since 1985. 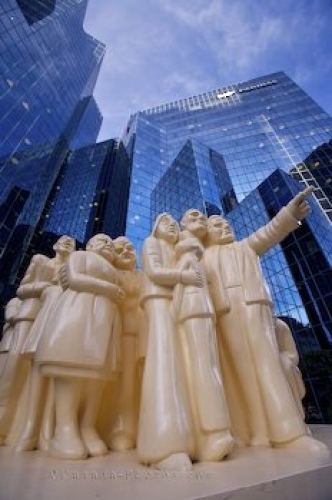 Picture of the Illuminated Crowd sculpture along McGill College Avenue in Montreal, Quebec.